How Do I Know When My Pet Needs Emergency Care? Vomiting/diarrhea: If these things occur more than once or are accompanied by blood or any signs of illness such as fever, lethargy, or anorexia, it is better to have your pet checked out. Dehydration can occur quickly, especially in small or young animals. Wounds: Anything that is bleeding, has a discharge, or is deeper than a superficial scrape should be checked out immediately. This includes punctures and burns. Urine troubles: Blood in the urine or difficulty/straining to urinate is an emergency that should be addressed as soon as possible. Fever: A rectal temperature that is greater than 103oF warrants investigation. Not eating: Anorexia that persists for greater than 24 hours should not be ignored. Breathing problems: A pet that is panting, coughing, or otherwise seems short of breath should be looked at immediately. Eye troubles: Any sign of an eye problem such as squinting, tearing, or redness should not wait, as eye issues can turn serious at the drop of a hat. Sudden lameness: Not putting weight on a limb or a new lameness can indicate a serious problem. Trauma: Don’t wait after a pet is hit by a car or falls. Even if it seems fine, there may be internal injuries that don’t show up until it is too late. Ingestion of a foreign body or toxin: If you are not sure if it might be a problem, don’t hesitate to call and ask. Seizures: If it is your pet’s first seizure, it is having back-to-back seizures or seizures are lasting longer than 3 minutes, your pet should be seen. Trouble delivering puppies/kittens: If your pet has been in active labor for longer than an hour without progress or if it has been greater than 3 hours since the last baby was delivered, your pet may need help. “Just not right”: When in doubt, call. Signs of a problem can include (but are not limited to) a bloated abdomen, collapsing, weakness or lethargy, pale gums, pain, or a change in behavior. Long story short, if your pet is experiencing a symptom on this list or you’re very concerned, don’t hesitate to call us! We are here to help you when you need it most, and are happy to answer your questions and take care of your pet whenever needed. 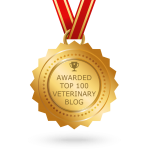 If there is no need for immediate treatment and you can monitor the problem at home or you can wait to see your regular veterinarian, we’ll let you know that. Sometimes, though, seemingly minor problems can become serious quickly, so please contact us if you are concerned about your pet’s health. We’re here for you 24 hours a day. Winter has arrived, and with its entrance comes a whole new set of concerns for taking care of your pets. While it’s true that they wear fur coats all of the time, animals can still suffer from weather-related injury and illness. It’s best to keep your pet indoors during the coldest part of the year, if possible. Cats especially can freeze to death, or they are killed while trying to find warmth, such as under the hood of a car. If you do keep an animal outdoors, be sure that it has adequate shelter out of the wind and moisture. Also make sure that it has access to fresh, non-frozen water at all times. Animals that are trying to keep warm outdoors will also need extra calories to do so. Never shave a pet that will be spending any time outdoors. Short-haired animals may even benefit from wearing a sweater or coat when outside. Very young and very old animals will have a lesser ability to keep themselves warm and should spend limited time in the cold. Inside or out, be sure that your pet has a warm, comfy place to snuggle up. Tiled or uncarpeted areas are often chilly! Also, take care around space heaters and fireplaces, which can be a hazard for cold or curious pets. Wipe your pet down after it comes in from the outdoors to remove any moisture or harmful chemicals, such as antifreeze, or rock salt from its coat and paws. You should pay close attention to your pet’s paws as they may become chapped or even cut on icy, uneven ground. Animals that have long hair in between their paw pads may need to have the area trimmed to prevent ice and snow from accumulating. Overall, it is probably best to keep your pet indoors as much as possible during cold snaps. Pets can suffer frostbite and hypothermia just as people can. Long, unsupervised time outdoors increases the likelihood of these things occurring. Play it safe and keep your pet warm this winter! Christmas trees, holiday decorations, and wrapped gifts can all be dangerous items that your pet is not used to having around. Keep decorations and candles out of the reach of playful paws and wagging tails. Decorative ribbons, string, and tinsel should also be kept away from pets. Electrical cords can pose a danger as pets may chew on them or become tangled in them. Before bringing any plants into your home, be sure to check the ASPCA’s list of toxic plants to avoid problems. Food and goodies of all kinds abound this time of year! Beware of treats containing chocolate, raisins, grapes, macadamia nuts, and the artificial sweetener xylitol. Table scraps, particularly those that are fatty or rich, can cause stomach upset ranging from mild vomiting or diarrhea to severe pancreatitis. Don’t forget about alcohol, either. That punch or eggnog might be irresistible to your pet, but can cause serious problems upon ingestion. Pets don’t always take to the holidays like humans do. A houseful of noisy strangers can be a disturbing event for shyer animals. Make sure that they have a quiet, safe place to “hide” away from the hub-bub. It is also a good idea to make sure that all pets are wearing identification and/or are micro-chipped with your current contact information in case they slip out the door with Uncle Bob. 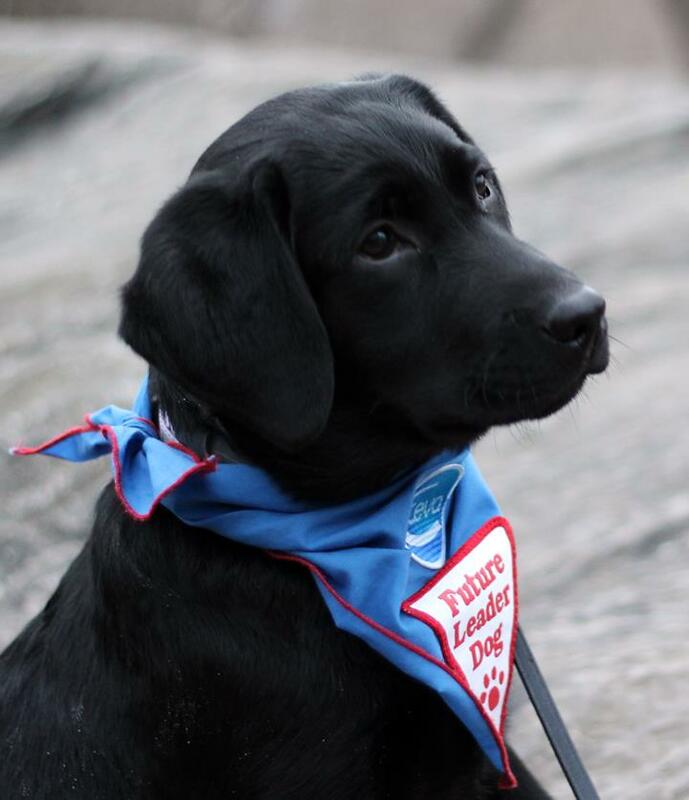 Ceva – Future Leader Dog for the Blind! What’s better than a snuggly, happy puppy? A snuggly, happy puppy with a job description that includes helping others! Oakland Veterinary Referral Service’s very own Dr. Theresa DePorter has had the honor to help train a puppy named Ceva to become a Leader Dog for the blind. Ceva earned her name from Ceva Animal Health, who has sponsored her care and training. training Ceva to be the best guide dog possible. Tremendous dedication was required as Dr. DePorter spent the first year of Ceva’s life exposing her to all sorts of situations and locations similar to what she will face on duty. This has helped Ceva to build a foundation that will allow her to be comfortable and confident for her future owner. 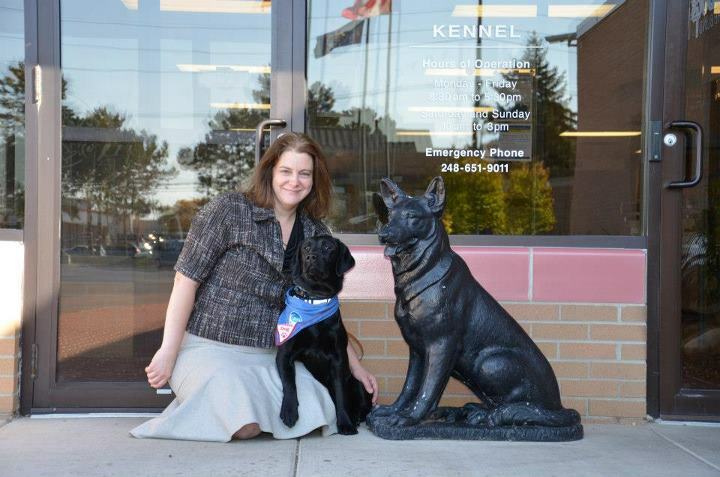 Because a guide dog is expected to keep her owner safe in any range of situations, Dr. DePorter took Ceva many places throughout her training including restaurants, veterinary conferences, and even New York City! This taught Ceva to be very good at ignoring distractions, even tasty ones!